The New Year cannot come soon enough for some players, who want nothing more than to turn the page on a disappointing 2014 campaign. With the new year just two days away and Opening Day less than 100 days away, it is appropriate that we look at the five players most primed to rebound from a down 2014 season. This list includes three veterans, who failed to reach their career norms last season and two youngsters that have yet to truly establish themselves in the Big Leagues. Each of these players has a very promising 2015 season ahead, which will make 2014 the exception, not the new normal. After two strong seasons from 2012-2013, Davis endured a very difficult 2014 season. After slashing .278/.350/.571 (Avg/Obp/Slg) from 2012-2013, Davis collapsed to a .196/.300/.404 slash line. On the field 2014 was tough enough, but Davis was also hit with a 25-game suspension with 17 games left in the season for using Amphetamines. Davis had been cleared to use Adderall in previous seasons, but not for 2014. However, this suspension is completely behind him and he has actually been cleared to use Adderall in 2015, so there is no concern over a longer suspension. While his K% is alarmingly high, that comes with the territory of being an elite power hitter and many of his other peripheral statistics point to a rebound in 2015. Davis’s BB% actually increased to a career high, which bodes well for his on-base abilities moving forward, but it also suggests that pitchers still feared Davis as a hitter. In fact, his .196 batting average was likely greatly influenced by a career low Batting Average on Balls In Play (BABIP) of .242. His career mark for BABIP is .320, so once that normalizes, Davis will soar above the Mendoza line and more resemble his 2012-2013 self. While Davis will not match his 2013 power numbers, he is likely to surpass his 2012 campaign, where he hit 33 home runs. Even in his down 2014, his ISO (Slugging Percentage – Batting Average) was not far off his 2012 ISO, which shows his power did not go anywhere. 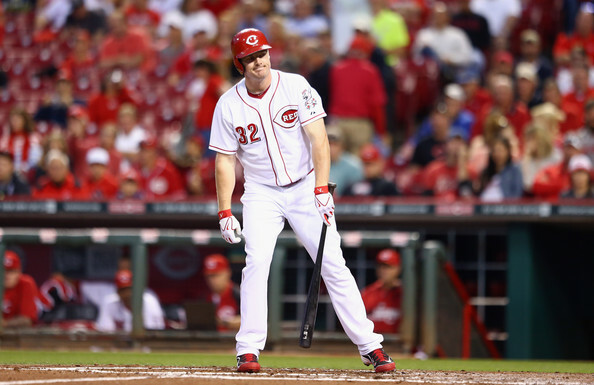 Jay Bruce’s 2014 season was painful to watch, especially because it came seemingly out of nowhere. Beyond being painful to watch, it was also painful to play, as Bruce battled nagging knee issues throughout the season that contributed to his reduced production. However, there is no reason to believe this is how Bruce will perform moving forward, even if the knee injuries are not entirely to blame for his struggles. Throughout his 6-year career before 2014, Bruce had been one of the most consistent players in the league, averaging over 2.7 fWAR per season. During his disastrous 2014, Bruce’s Ground Ball% soared, while his Fly Ball% sank to a career low. This does not indicate a healthy power hitter, but rather someone who does not have their legs underneath them and must instead do their damage using their upper body. The Steamer projection system calls for Bruce to post a 1.4 WAR, which would be a 2.5 win improvement. However, I think Steamer is being too conservative in its projection because Bruce should be fully recovered from knee surgery before the 2015 season, which will allow him to return to his previous norms. I would project Bruce to post a season closer to 2011, when he played about average defense and slugged 32 home runs, en route to a .349 wOBA and a 3.0 fWAR. Longoria probably does not fit with the rest of the players on this list because he actually turned in an above average campaign by most players’ standards, but not his own. His 3.4 fWAR would have been a career low, if not for his injury-shortened 2012 season. Despite this being the first unimpressive season in Longoria’s extraordinary career, many fans are concerned about his decline beginning well before his $100 Million extension starts in 2017. Longoria’s 2015 season will quell any concerns about his new extension, at least the first few years of the deal. The 29-year-old third baseman averaged over 6 wins per season for his first 6 Big League seasons, and is unlikely beginning his decline, in what should be the middle of his prime. Instead, Longo suffered from a poor batted ball profile in 2014, which should readjust to his norms and an unusually average season on defense. Longoria saw a slight uptick in his GB%, but more significantly his FB% dropped 4% and saw a 4% increase in Infield Fly Balls (IFFB). Both of these shifts suggest that his timing was off, which is a poor excuse for an entire season; however this is not something that persisted the entire season, as his FB% increased by 10% in the second half and his IFFB% decreased by nearly 4%. He will likely enter this season with his normal timing, which will help him reach his career offensive norms. Longoria also posted the lowest HR/FB rate of his career, which will not repeat itself, as that usually remains near a player’s career norms, so he should expect at least a 5% increase, which will significantly help his power output. On the defensive end, I do not put much weight in one season of fielding statistics, so I do not have any concern over his defense, since he grades out as a gold glove defender by any metric for his career. With improved timing and a normalized HR/FB rate, Longoria will put to rest any mentions of his decline. Salazar differs from the players above, as he has yet to truly establish himself at the Major League level. He dominated during his 50 innings of work in 2013, striking out 11.25 batters per 9 innings. However, in his first chance at a full season, Salazar struggled mightily to match expectations. He finished 2014 with a 4.25 ERA across 110 innings, but his 3.52 FIP suggests he was better than his ERA indicates. But there are plenty of more reasons for optimism heading into 2015 and the Indians should expect a more similar performance to his 50-inning sample in 2013. Salazar is not going to strike out 11 batters per 9 innings again, but he does not need to. 2014 was a season of two halves for Salazar, as he cut his FIP from 4.71 in the first half to 2.83 in the second half, which fit with his ERA dropping more than 2 runs from the first half. The second half version of Salazar most closely resembles the real Danny Salazar, as in the first half he was plagued by an inflated BABIP of .369 and an enormous HR/FB rate of 14.8%. Once these things that are not entirely under his control normalized, Salazar thrived, which is what I expect him to continue in 2015. He should be able to carry over his impressive K/BB ratio of 2014 and he is unlikely to have a BABIP north .340 again, which will help keep his ERA closer to his FIP. Carlos Martinez is very similar to Salazar, in that he has yet to match expectations at the Big League level, but this will be his first opportunity at being a full-time starter. Even in his time stuck in purgatory between starting and relieving, Martinez’s talent has shined, but the results have not always matched what people have seen. In his 117 2/3 Major League innings, the righty has carried a 4.28 ERA, but a 3.15 FIP, which points to better results ahead, once his surface statistics match his peripherals. While Carlos Martinez has been hurt by an inflated BABIP of .336 for his career, but based on pitchers with a similar profile, that is not likely to persist. The 13 pitchers in 2014 with at least 8 K/9 and at least a 50% Ground ball rate average a BABIP of .293, which suggests that Martinez is likely to see improved batted ball results. One thing he can control is home runs and Martinez has been fantastic at stifling home runs, allowing just .38 HR/9 through his career, which bodes well for future success, especially since he can strike guys out. Martinez will need to limit his walks better, but even when he walked over 3.5 batters per 9 last year, he carried an FIP of 3.18, so if he is more lucky with balls in play, it should not be an issue. I think Martinez should excel in his first opportunity as a full-time starter, but I wouldn’t expect him to reach the 200-inning threshold, as he will need to build up his workload, but also because his high number of walks will drive up his pitch counts. I expect Longoria to turn in the best season of the players on the list, which isn’t surprising as he is the only established star and the one coming off the best season. Jay Bruce is my pick for the largest improvement, because I believe his performance was heavily influenced by his knee injury, which should be behind him. Of the pitchers, I’d expect Martinez to turn in the best season because I believe in his incredible talent, but also because his profile of high strikeouts and groundballs bodes well for success. This entry was posted in Uncategorized and tagged Carlos Martinez, Chris Davis, Danny Salazar, Evan Longoria, Jay Bruce by baseballstooges. Bookmark the permalink.